Alex Lam is a dapper vampire in Get Outta Here. 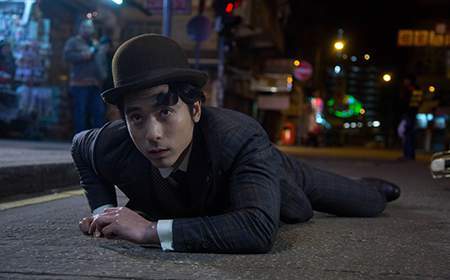 Scattershot and sometimes annoying vampire-in-Hong-Kong comedy turns out to be surprisingly OK, thanks to its topical humor, occasional surprises and Alex Lam’s genial lead performance. Not a standout but better than one expects in these meager times for Hong Kong Cinema. Second generation Hong Kong actors who follow in their parent’s footsteps by playing a western vampire in a middling Hong Kong movie are a rare breed. Actually, they don’t exist at all outside of Alex Lam, the son of superstar actor-singer George Lam. The elder Lam once starred as a western vampire (i.e., not a hopping need-a-Taoist-priest-to-stop type) in the comedy A Bite of Love, so it’s with minor amusement that his son Alex does the same in Get Outta Here. The younger Lam has thus far had an unimpressive acting career but he flips the script with Get Outta Here, turning in an effective and surprisingly endearing performance as Joe Tang, a Hong Kong-by-way-of-London vampire who awakens from his century-long slumber when property developers dig up his coffin. Right away, the dapper gent takes to his new Kowloon environs before becoming attracted to kong lui Apple (singer J. Arie) – or rather, becoming attracted to the blood dripping from her wrist, which she slashes to guilt her inattentive boyfriend (Siu Fei). When Apple gets back to her flat, Joe’s practically on her doorstep already. Lucky for Apple, Joe won’t intentionally consume human blood and soon he decides to stay with Apple, her grandmother (Anna Ng) and their British boarder (Gregory Charles Rivers) in their aged Kowloon flat – against their will, naturally. Joe’s goal is to somehow reconnect with Man-Ying, his vampire attendant from a century ago who should presently be wandering around Hong Kong. The flat residents are understandably scared of Joe, but they eventually accept him and soon Joe is helping them fend off unruly gangsters while generally being OK with his surrogate family’s frequently odd behavior. Despite being a vampire prone to bloodthirsty hot flashes, Joe is pretty sweet and more-or-less operates as the film’s straight man. By contrast, his flat mates are shrill, temperamental and over-the-top. There’s some humor in this dynamic, mostly due to Joe’s occasional cluelessness. However, the shtick overwhelms the story and for a good while, Get Outta Here feels aimless. Villains do lurk in the background, particularly a sinister land developer (Michelle Loo) and her creepy-charming lackey (Louis Cheung), but the film takes a long time before explaining their purpose. Also, many gags are teased then lay dormant for too long. One subplot features Joe searching for Man-Ying via humorously bad YouTube videos, while the appearance of a vampire chicken (played by “Puppy the Hen”) promises hilarity (vampire chickens are obvious comedy gold). However, both gags are forgotten until the film needs them for a convenient plot device, when they should be developed regularly alongside the wacky characters and screwball antics. Get Outta Here skitters around its driving plotline and squanders tension, getting by mainly with its playful tone, baroque style and pronounced overacting. Amazingly, that’s sometimes enough. Director Nick Leung, producer Gordon Lam and the film’s army of screenwriters inject the movie with some surprise and plenty of local humor, riffing on Chinese culture, social issues and untranslatable idioms. The acting is passable for exaggerated local comedy. Former TVB actor Gregory Rivers annihilates the screen with his histrionics, particularly during one monologue where he rails at God with spittle-spewing fury. In their supporting roles, Louis Cheung is surprisingly sympathetic, and Anna Ng and J. Arie are both shrill but sweet.